An article I wrote on an exceptional talk by Paramacharya of HimalayanAcademy.com (he'd also reviewed my book). I was thrilled because I resonated so well with everything he said. Later, I got a chance to interview him as well. He had one of the best powerpoint presentations I've seen controlling it with a mini iPad. It was an amazing combo of Authenticity and modern Technology! But more than that, such deep insights and evolutionary views on Dharm! Their Hinduism Today magazine and books are par excellance and he's the editor. They are showing Hindus better models for communicating our profound heritage. My deepest gratitude for your service to Dharm. 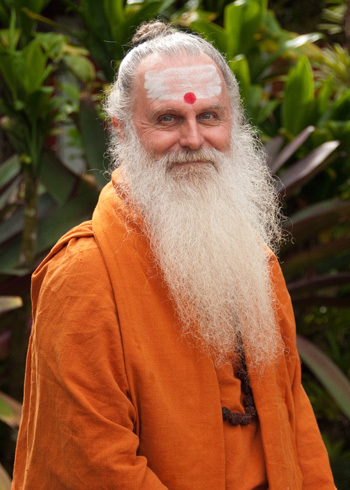 "Dharmo Rakshati Rakshitah"
Santa Clara: Paramacharya Sadasivanathaswami of the Himalayan Academy in Hawaii is the editor-in-chief of Hinduism Today magazine, and he is one of the stewards of Saiva Siddhanta Church, Himalayan Academy and Hindu Heritage Endowment. Paramacharya began his talk with science and consciousness, on how quantum physics now understands that consciousness created the brain and not vice versa. He then talked about the evolution of Hatha yoga in America, how media initially viewed Yoga has a heathen invasion of America to where it’s become so popular. Time magazine has put Yoga on its cover twice and now it’s become so hot, so cool, so this minute! 22 million Americans profess to practice Yoga, and it’s a 20 billion dollar industry. Michelle Obama teaches yoga on the White House lawn as part of a program to reduce obesity in children. The US Government Patent Board has 1876 Copyrights, 567 Patents and 2993 Trademarks that are related to Yoga. Yogis are using these to tie each other’s hands as infringements on the use of Asanas and terminologies. US Federal court last year has agreed that a specific sequence of 26 poses can’t be copyrighted. A politically savvy group, the Hindu American Foundation, is fighting to take back Yoga from being stripped from its authenticity and becoming commercial. Paramacharya spoke about the Kundalini by narrating the story of someone who experimented with all the Kundalini techniques he read in a text, on his own without a Guru. He had wonderful spiritual experiences, but then he had a long descent into great pain and sorrow. He described it as though too much of an electric current was driven through a small wire, which his nervous system, and burned through his spine. He couldn’t sit, stand, or sleep, and finally got cancer of the spine. This is what happened by the early arousal of the Kundalini. It’s become a bit too popular to talk about Kundalini Yoga in unknowledgeable circles and Paramacharya would like this change. His Guru says to be cautious of those who promise great Kundalini awakening and spiritual rewards, without proper preparation, initiation and renunciation. Those who get angry should not practice Kundalini Yoga. There are four main paths, or Yogas: Karma, Raj, Bhakti and Jnan. The general opinion is that one should pursue the path that is akin to one’s nature. Paramcharya has another take on who should practice these Yogas. Jnan Yoga is for those with a strongly developed mystical sense, it’s a direct experience of higher states of consciousness, of what a Yogi becomes and not an intellectual study of the texts. He says that very intelligent people often benefit more from opening their hearts through Bhakti Yoga. Karma, Raj and Bhakti Yoga are a pre-requisite for Jnan Yoga for the proper preparation for Jnan Yoga. These Yogas are cumulative stages and none should be abandoned along the path, all four need to be integrated.